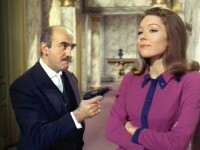 Whilst Steed observes, Emma slips a culture slide into a microscope to discover it says, "Mrs. Peel—We're Needed!" Steed and Emma end up pushing his antique Rolls down the road. Brodny makes his return accompanied by an "invisible man," a colleague who has devised a plot to bankrupt the government by duping certain officials into believing that a formula for invisibility actually works. This is unquestionably my least-favorite Emma Peel episode (the subhead should read, "Levene makes a bomb"). I'm sorry, but even though the show is supposed to be a tad goofy, Brodny is way too much to take, and he's even worse this time than he was in "Two's a Crowd." 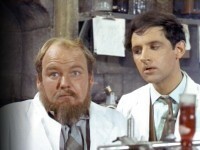 Only one real bright spot, when Steed and Emma discuss chemistry (center left). By the way, Pablo Alonso of Argentina points out that Brodny says he has tickets for a Beatles concert. But the last Beatles concert was in San Francisco on 29 August 1966, so Brodny bought tickets for a non-existent gig. Of course, it is possible that, when this episode was produced, nobody realized the San Francisco gig would be the last. That they mentioned the Beatles at all is curious considering the general absence of real-world references in the show. Acronym Alert: MOD is the Ministry of Defence. Shenley Lodge, Shenley, was used as Quilby's house. The embassy was actually Edge Grove School, Aldenham, and Daviot Hall was the oft-used BR Centre at the Grove, Watford.